Featured Song "It's a Dog's Life"
"Life's Ruff" is the twentieth episode of The Adventures of Super Mario Bros. 3; it aired alongside another episode of The Adventures of Super Mario Bros. 3 entitled "Crimes R Us". 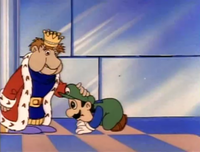 Luigi greeted by King Windbag. Luigi has arrived at the castle of King Windbag. As Luigi enters the dining room, he believes he's being yelled at by King Windbag, and ducks from a cooked turkey that had been thrown in his direction. Luigi then realizes that King Windbag had been bossing his servant around. Right after he properly greets Luigi, King Windbag bluffs about how the floor is dirty, and orders his servant to mop it up. Luigi tells Windbag that he has been sent over by Princess Toadstool so that he could try to make him less of a bully. Windbag thinks Luigi is bluffing, then pulls out his magic wand and threatens to shoot his servant, demanding for him to serve him a cooked duck. As the servant runs off, Windbag comments that a dog would make a better servant. Overhearing this comment, the servant tells himself that he might as well be a dog due to Windbag's harshness. 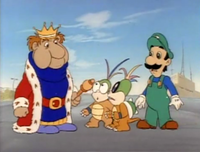 As the servant walks off, Hip and Hop Koopa, who had been hiding behind a pillar, get an idea upon hearing the servant complain, noting that King Koopa had told them to follow Luigi so that they could cause trouble for him. After Windbag yells for his duck, the servant returns with a covered plate, only to be tripped by Hip. While Hip puts on the servant's hat, Hop hides on the covered plate. Luigi after being transformed into a dog. When Hip enters Windbag's throne room disguised as the servant, Hop leaps out from under the covered plate and steals Windbag's wand from out of his hand. As Windbag tries to get his wand back, Hop throws it over to Hip, who uses it to transform the king into a bulldog. Luigi tries to take the wand back from Hip, but Hip throws it to Hop, who in turn uses it transform Luigi into a gray mutt. With Windbag and Luigi as dogs, the two of them chase Hip and Hop out of the castle and down several flights of stairs to the ground. A Ptooie pops out of a Warp Pipe and tries to shoot Luigi, but it misses. Luigi chases Hip and Hop up onto some platforms, but is assaulted by a Lakitu that throws a Spiny at him. As Hip and Hop climb into a pipe, Hop knocks him back with the wand before they go down it. Left with no other options, Luigi and Windbag follow Hip and Hop down the pipe. The two dog forms Luigi and Windbag before avoiding the incoming vehicle. At the other end of the warp, Luigi and Windbag find themselves crawling out of a manhole in the Real World, more specifically, Miami, Florida. The two of them hide in the manhole as a trackless train drives over their heads, and when they come out again, Luigi spots Hip and Hop riding on the back seat. Following the train to a gated hotel, Luigi tells Windbag to wait for the gate to open for the next car, so that they can run inside with it. King Windbag huffs about how royalty never runs, but he goes along with Luigi's plan. When the train pulls up at the hotel, Hip and Hop steal the hats off of the two ladies sitting in front of them, and run inside, where they smell food. Luigi notes that dogs aren't allowed inside, and decides to sneak in through a dining room window. Hip and Hop throwing foods from the buffet table. Hip and Hop reveal themselves by throwing all sorts of food around the room from a buffet table. As Windbag jumps onto the table, he crashes into a bowl of lobsters which pinch his body, as Hip and Hop flee. Before the transformed dogs can chase Hip and Hop into the next room, the dog catcher shows up. He chases Luigi and Windbag upstairs, where they jump out of a window, and down a slide into the pool. After crossing the pool, Windbag gets captured in his net. Luigi chases Hip and Hop to a sports car in the parking lot, but he too is captured by the dog catcher. While Hip and Hop go for a joyride in the sports car, Luigi and Windbag are thrown into the back of the dog catcher's truck, where Windbag and Luigi comment that they'll never get the wand back and that they'll be stuck as dogs permanently, and be unable to return home. While Hip and Hop drive off, they listen to a report on the radio about a space shuttle launch at the Kennedy Space Center going on the next day, and decide to visit it. The two transformed canids meets several other dogs. Meanwhile, the dog catcher brings Luigi and Windbag to the Florida State Poochitentiary, where they're sentenced to a kennel with several other dogs. 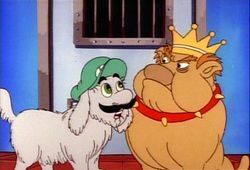 When Windbag tries to bully one of the dogs around, he counters Luigi's bickering by stating that he's a king. Luigi tells Windbag that if they work with the dogs, they can form a pyramid to reach the air vent on the ceiling. Because the dogs won't obey the rude Windbag, Luigi politely tells them what to do, and then gets a reluctant Windbag to stand at the bottom of the pyramid. As Luigi makes his way through the vent, another dog's tail causes Windbag to sneeze, collapsing the pyramid. Luigi travels through the vent to the dog catcher's office, where the dog catcher is asleep in front of the TV. As Luigi climbs down from the vent on a hanging light wire, a news flash appears on the TV. The reporter is on the highway, where she gives an emergency report about a sports car rampaging through Florida to the Kennedy Space Center, just as Hip and Hop drive past her. Luigi after falling from the dangle lamp. 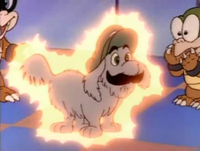 The light that Luigi is on falls down from the ceiling, and hits the dog catcher's head, waking him. As he tries to grab Luigi, Luigi leaps onto the control panel, and unintentionally releases all the dogs in the building. As Luigi slips out of his office, Herman grabs him by the tail. However, the dog catcher lets go as all of the dogs come running over him. When Luigi meets up with Windbag, they run outside, hijack the dog catcher's truck, and drive off. Luigi and Windbag digging their way through the fence of the Space Center. Later, outside the Kennedy Space Center, Luigi and Windbag are unable to get over the surrounding fence by jumping. Windbag points out that they should dig, seeing as how they're dogs now. Meanwhile, as a group of astronauts make their way to the space shuttle, Hip puts the two in the back to sleep with the wand, allowing him and Hop to change into their suits, just as Luigi and Windbag come out on the other side of the fence. Luigi and Windbag are startled by the dog catcher, who tries to catch them with a lasso. Luigi and Windbag take care of their captor by running circles around him, and he gets tangled up in his rope, allowing them to chase after Hip and Hop. King Windbag tackles Hip and Hop, and stops them from boarding the elevator to the shuttle. As Hip drops the wand, Luigi grabs it and tosses it over to Windbag. Luigi and Windbag being reverted back into humans. With his wand back, Windbag uses it to put all the humans nearby, including the dog catcher, to sleep. He then restores himself and Luigi back into humans. As Hip and Hop try to run off, Luigi grabs them, while Windbag creates a Warp Zone with his wand, which Luigi drops them into. Looking at the sleeping man, Windbag feels that he would be a kinder dog catcher if he knew what it was like being a dog, so he turns him into a yapping poodle for a few seconds. Windbag then uses his wand to wake everyone up, and creates another Warp Zone that he and Luigi enter. As the dog catcher wakes up, he can't believe the "nightmare" he just had, and proceeds to scratch his ear and his foot. Back at Windbag's castle, the king can be heard yelling "Duck!" to his servant. However, Luigi watches as Windbag presents his servant with a cooked duck, along with mashed potatoes and peas. Windbag winks to Luigi, as a reminder of what he learned on their adventure, and Luigi winks back. The reporter on the TV mentions that Hip and Hop are driving a red sports car, even though the car itself is actually blue. King Windbag's bulldog snout constantly changes from brown to orange. When Hip and Hop take the womens' hats, the hats are yellow and pink, but when they are going to the hotel, they are white and yellow. When they are inside the hotel, the hats are yellow and pink again, but they turn pink and purple in one shot. Toad's voice is used for the servant's scream when Windbag zaps near his feet. When Hip and Hop first appear, the latter's hair is pink. It later reverts to rainbow in subsequent shots. When Hip says "Now King Windbag...", his mouth does not move. In a lot of shots in this episode, Hop's hair is yellow instead of rainbow. When Hip tossed King Windbag's wand to Hop, Hop's had flashed orange. When the Piranha Plant comes out of the Warp Pipe, it shoots black spike balls, but when Luigi is dodging them, they are green. When Hip and Hop are running up the stairs outside King Windbag's castle, Hop's glasses are green. When Luigi and King Windbag are chasing Hip and Hop outside the castle, but when Hop knocks Luigi back with the wand, they are shown inside the castle. When the episode first shows Miami, the manhole has lines on it, but in the next shot, it does not. In some shots of this episode, King Windbag has no collar on. When Hip and Hop are throwing food in the hotel, Hip's head is orange. 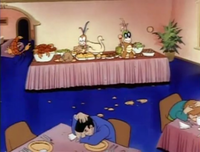 When King Windbag crashes into the bowl of lobsters, he is on a table, but in the next shot, he is shown on the floor. When Hip and Hop run out of the dining room, both of their heads are orange. When Luigi and King Windbag land on the cactus, the lobsters fall off King Windbag, but when Herman is about to catch him, the lobsters immediately appear back on him. When Hip and Hop are driving away in the sports car, Hop had no glasses. When riding in the sports car, Hip was driving and Hop was by him, but when they are headed for the Kennedy Space Center, they swap places. When Hip and Hop were headed for the Kennedy Space Center, Hop was all orange, also blue hair similar to Cheatsy's was shown when the car was driving. When all the dogs were escaping, they were all similar to the brown dog in Luigi and King Windbag's cage. 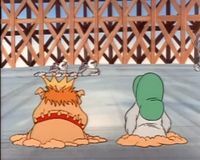 After they escape the Poochitentiary, Luigi and King Windbag try to get to the Space Center, which they are shown on the side of the Space Center for one shot. When King Windbag says "What do dogs do best...Dig!" there is a problem with his eyes. When the astronauts step inside the elevator, their suits get darker. In some shots of this episode, Luigi has no "L" on his hat. At the end of the episode, King Windbag puts some peas on the servant's table, when this happens, the peas are shown white instead of green. 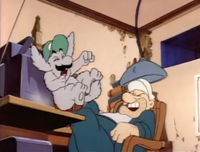 This is the only episode of any Mario cartoon that Mario doesn't appear in, nor is he mentioned, making Luigi the only character to appear in every episode; it marks the first time, however, when Luigi appears without Mario. In addition to Mario, neither Koopa, Princess Toadstool nor Toad make an appearance, although Koopa and the Princess are both mentioned. The second time Luigi would appear without Mario in any piece of media would be nearly twenty-three years later in New Super Luigi U. This is the only episode of The Adventures of Super Mario Bros. 3 in which a Lakitu appears. One was previously seen in The Super Mario Bros. Super Show! episode "Mario and the Red Baron Koopa". This episode has a similar plot to Super Mario Bros. 3. Just as in the game, a king has his magic wand stolen and is turned into an animal, and a Mario brother has to get the magic wand back. The episode even features the same Koopaling who took over Ice Land in Super Mario Bros. 3 (which may be the same location), Lemmy Koopa, though in the game he was not accompanied by Iggy Koopa. Prior to the corresponding Captain N episode, Luigi narrates the trailer for "Life's Ruff" by saying "So you think your life is hard? Look at what happened to me, I got turned into a dog!" This page was last edited on March 30, 2019, at 16:35.